There are a couple of things I know to be true. People do not change. I will always be a horrible dancer, playing Taylor Swift at a party will make everyone pause in their steps, and my sister is one of the top Beauty Gurus on this plant. Jacqueline is currently studying Engineering, where she can easily build a house. Not just design one, she actually builds them too. She can effortlessly march across the design studio picking out flaws. All the while her hair looks sleek and put together even under a construction hat. Also, another fun fact about Jacquline, is that some people might even call her the Pizza Queen. 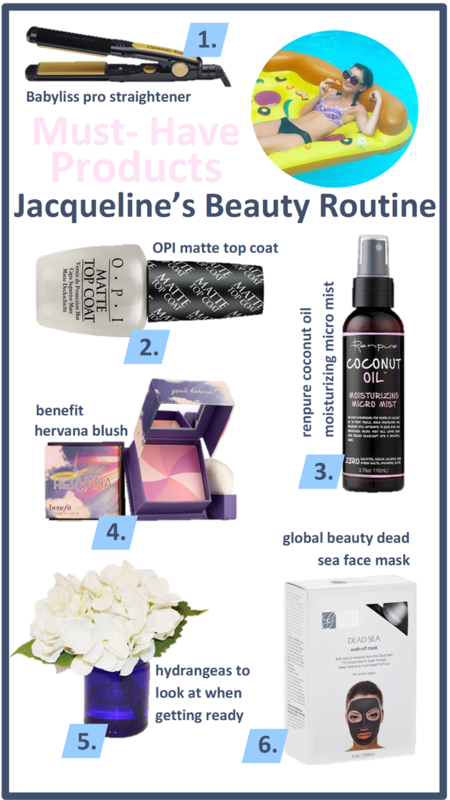 Lucky for us Jacqueline was more than willing to share some of her secrets to her stunning beauty routine. 1. Babyliss pro straightener// This does wonders for hair. It is such an intense heat you only need to run it through your hair once or twice. 2. OPI matte topper// I want all things matte, and that includes my nail polish. Instead of a clear coat, trade that in for this. 3. Renpure Coconut Oil// This oil makes my hair really soft, it smells sweet, and it eliminates a lot of frizz from blow drying. Despite it being an oil it does not make my hair feel oily. 4. Benefit Hervana Blush// I love how there are three colors in one and I can mix it up depending on how dramatic I want it to look. 5. Hydrangeas// Getting ready can be a process and you need your favorite flowers to look at in the morning or before a night out. 6. Global Beauty Dead Sea Face Mask// Once a week I like to use this to exfoliate my skin. I usually do this as a reward to myself while studying.